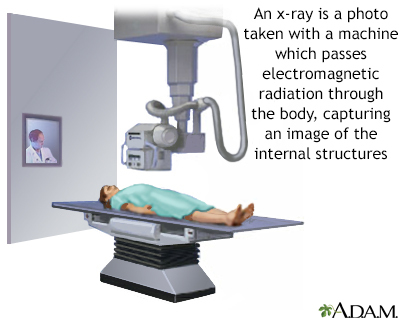 An abdominal x-ray is an imaging test to look at organs and structures in the abdomen. 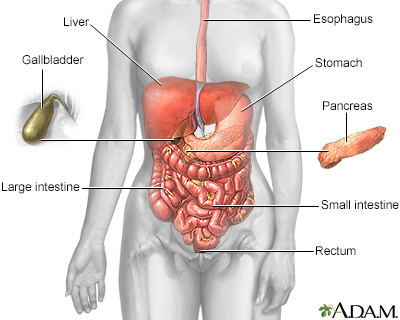 Organs include the spleen, stomach, and intestines. When the test is done to look at the bladder and kidney structures, it is called a KUB (kidneys, ureters, bladder) x-ray. The test is done in a hospital radiology department. Or, it may be done in the health care provider's office by an x-ray technologist. You lie on your back on the x-ray table. The x-ray machine is positioned over your abdominal area. You hold your breath as the picture is taken so that the picture will not be blurry. You may be asked to change position to the side or to stand up for additional pictures. Men will have a lead shield placed over the testes to protect against the radiation. You wear a hospital gown during the x-ray procedure. You must remove all jewelry. There is no discomfort. The x-rays are taken as you lie on your back, side, and while standing. The x-ray will show normal structures for a person your age. There is low radiation exposure. X-rays are monitored and regulated to provide the minimum amount of radiation exposure needed to produce the image. Most experts feel that the risk is low compared to the benefits. Pregnant women and children are more sensitive to the risks of the x-ray. Women should tell their provider if they are, or may be, pregnant. Tomei E, Cantisani V, Marcantonio A, D'Ambrosio U, Hayano K. Plain radiography of the abdomen. In: Sahani DV, Samir AE, eds. Abdominal Imaging. 2nd ed. Philadelphia, PA: Elsevier; 2017:chap 1.